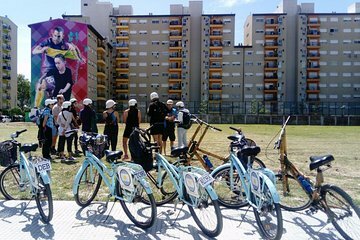 Combine cycling and sightseeing on this full-day bike tour and enjoy an action-packed itinerary that ticks off the best bits of Buenos Aires. Weave your way around the cobblestone lanes of San Telmo, pass the colorfully painted houses of La Boca and glide along the modern waterfront of Puerto Madero. Take a detour through the Costanera Sur Ecological Reserve, stopping to tuck into a delicious Argentine-style BBQ (included). After lunch, visit Evita’s grave in the Recoleta Cemetery, then pedal to Plaza de Mayo to see the famous Casa Rosada. Great way to see the sights of BA. Very friendly guide. This was a great tour, a wonderful way to see the sights and get some exercise at the same time. Raymond a fellow Kiwi, was very knowlegable, and showed us some of the areas you wouldn't see on your own, or on a bus tour. Fantastic way to see Buenos Aires and guide Marcelo was a font of knowledge. Pity the day was so cold as at times when we were listening to what Marcelo had to say it felt like we were freezing to the bone. Great way to see the city. Full of stops but must be a more experienced rider in a big city. Guides were FULL of knowledge and for a short stay I saw more in one day than I would have on my own in a week. Too much talk! The lengthy history lessons were certainly informative, but got really boring. I got tired of standing around waiting to get going again. The two assistant guides did an excellent job keeping us safe amid the traffic, they were nice, friendly and helpful. Great tour! The guide was friendly and very knowledgable. He was also very passionate about Buenos Aires history. There were about 10-11 people in the group and they sent an extra guide with us. They were mindful of our safety as well. Not many photo stops though but I suppose that is to be expected when you're cycling. I chose to take this tour as a way to learn more about the layout, history and culture of Buenos Aires, and get in some exercise to boot. It was a terrific decision. Our group of seven people were led by two guides around many of the interesting neighborhoods in Buenos Aires, including La Boca, Puerto Madero, Recoleta and Microcentro. Along the way we had chances to stop and sightsee/shop, were given a lot of great information about the city and it's people, and enjoyed some spectacular weather temps in the 60s and 70s Farenheit, and I took the tour near the end of August, their Winter. The guides made safety their first priority and even with the rather chaotic way in which people drive there, I didn't feel at all worried. Great way to orient oneself to the city and figure out where to spend more time later. This tour was truly comprehensive, and I learned so much about the history and culture of Buenos Aires! Our guide, Ane, was really knowledgeable about football, politics, and the geography and her love of BA was contagious! I've gone on many bike tours in different cities but this one was my favorite! I would absolutely recommend it!